A week after Cyclone Idai lashed southern Africa, flooding still raged on Thursday as torrential rains caused a dam to overflow in Zimbabwe, threatening riverside populations. Spokesman Herve Verhoosel, of the World Food Programme, told reporters in Geneva of the "alarming news" that the Marowanyati dam in Zimbabwe was hit by heavy rains overnight, putting populations in the region at risk. Mozambique's environment minister, Celso Correia, who is heading up the government response team, said in Beira Thursday evening that the confirmed death toll in his country was 242, with at least 142 injured and an untold number still missing. "Don't create panic," Correia urged other government officials as more updates on the devastation trickled in. He said some 65,000 people had been saved by rescue workers who plucked them from rooftops and trees, and 182,000 had been affected by the flooding. "Obviously all numbers are preliminary. ... They are changing every day, every moment," Correia said, adding that the most worrying issue now was health, with cholera a major concern. He said a "bigger-size rescue operation" must be launched in the region of some 350,000 people, where many remain marooned on islands created by the floodwaters. The death toll was sure to rise. It will be days before Mozambique's inundated plains drain toward the Indian Ocean and even longer before the full scale of the devastation is known. Mozambican President Filipe Nyusi has estimated that 1,000 people could have been killed in his country alone, while Zimbabwean officials say some 350 people may have died there. In Malawi, at least 56 people were killed. 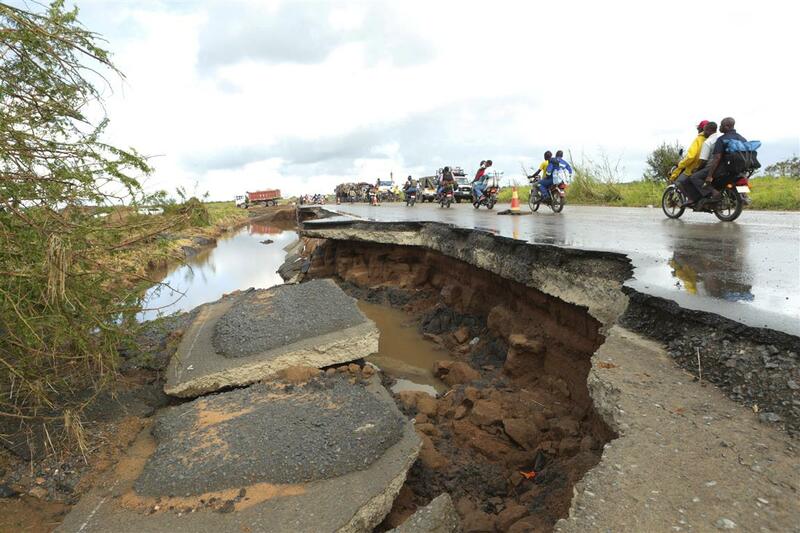 Homes, villages and entire towns were submerged across central Mozambique, where flooding created a muddy inland ocean 30 miles (50 kilometers) wide. 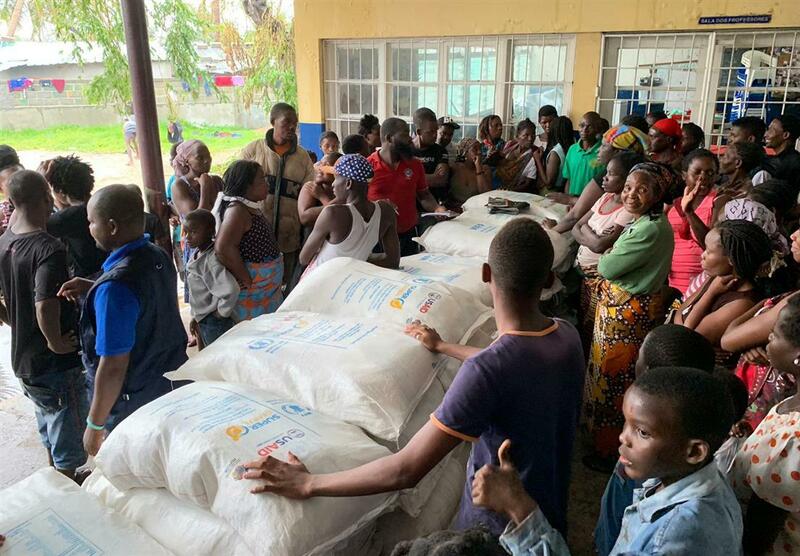 The U.N. food aid agency said 400,000 people were displaced and "in urgent need of life-saving assistance" in Mozambique's coastal city of Beira and flooded areas along the Pungue and Buzi rivers. "A family saw their brick house swept away from them. When they went to another house for safety, the roof collapsed," Machiel Pouw, Save the Children's response team leader in Mozambique, said in a statement. "Another family fled for safety in a tree. There are tens of thousands of heartbreaking stories like this, lives shattered over the past days." WFP said Malawi's government had reported more than 920,000 people in the country were displaced by the floods, though it projected the number would decline as they return home. In Zimbabwe, 90 percent of the district of Chimanimani — the country's hardest-hit — was significantly damaged, the agency said, estimating that 200,000 people would need food assistance over the next three months. Zimbabwe's President Emmerson Mnangagwa declared two days of mourning starting Saturday for the victims, saying he witnessed "unmitigated despair" during a tour of the area on Wednesday. "I can say I am a bit lucky. My wife and son are still here with me but for everything else, I have to start from scratch," he said. Dada had a few food items handed out by the Zimbabwe military, but he knew that wouldn't last long and he was eager to start growing crops again. Like many people here, he survives on agriculture.